Actually, in this film it's distressingly ordinary! 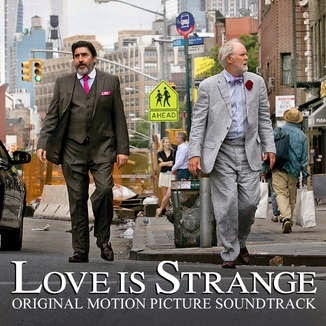 Love Is Strange is a movie with its heart in the right place. Alas, every other part is as misplaced as a storage cube packed by drunken movers. It is, simply, a lousy movie poorly directed by Ira Sachs and badly written by he and Mauricio Zacharias. The setup is that Ben (John Lithgow) and George (Alfred Molina) decide to tie the matrimonial knot after 39 years of cohabitation. A crisis emerges when their marriage catches the attention of the bishop who oversees the tony private Catholic school where George teaches music and demands George's dismissal. This means that he and George must sell the condo in which they've lived for decades. Script problem # 1: In what has to be the fastest real estate closing in history, they have to move out immediately and have nowhere to go. Script problem # 2: Who knew that private school music teachers made enough bread to afford such a lovely apartment in Manhattan? With no income other than George's pension, the couple is temporarily homeless and the only place in which they could live together is with dippy New Age friend Mindy (Christina Kirk in a cringe-worthy dumb role) in Poughkeepsie. That's not happening because, well don't you know, gay men just don't live outside of New York. Call that script problem # 3. Instead, the newlyweds must separate. Ben moves in with his nephew, Elliot (Darren Barrows), who does something or other in film; his uptight novelist wife Kate (Marissa Tomei); and their son, Joey (CharlieTahan). While Ben snoozes in the bottom bunk of Joey's room, George crashes on the couch of two gay cop friends, Ted (Cheyenne Jackson) and Roberto (Manny Perez), whose cramped apartment is filled with partiers and voguers. Script problem # 4: Gay cops? What is this, The Village People? I think you begin to see the problems. Script problem # 5: Lithgow and Molina are older actors who are better known for their work on the boards than on the screen. Few young people know who they are and fewer still will want to see this film. Fine. Lord knows we need more adult entertainment, but if you're going this route, don't write a light rom-com-meets-lame farce for 20-somethings. Give us something frothier than a frappuccino with extra cool whip. And don't telegraph what will/must happen with set-ups so obvious Inspector Clouseau wouldn't need to bumble upon the solutions. Don't pad the movie with subplots that go nowhere, and for heaven's sake don't try to imbue Marisa Tomei with anything resembling gravitas. Script problem # 6: While you're at it, if George must be a music teacher, have him love something other than Chopin. Chopin was a great composer, but with a script this leaden you don't want dreamy music suggestive of naptime. Some critics have called the performances of Lithgow and Molina "courageous." Really? Did I miss something? Did the calendar roll back to 1984? Each is perfectly competent, but nothing more. In life they are great friends and these roles seemed little more taxing than a walk through for each. They are, however, head and shoulders above the rest of the cast who, with the exception of young Tahan, seems to have been chosen because they fit the bill for character cutouts devoid of depth.